The Body of Truth: After reading an article on the protests outside the Royal Courts of Justice in London, regarding Abu Hamza’s deportation, I was shocked when I saw a certain two pictures from the protest. 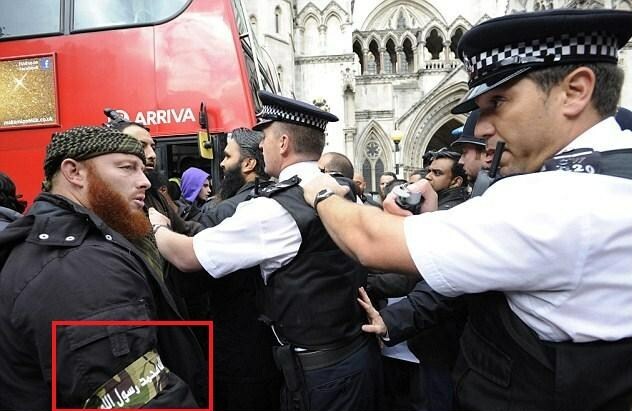 A white, Muslim man was photographed wearing the armband of the Mujahideen over a military style jacket, if this wasn’t enough, he was showing his allegiance to the worldwide Islamic militia in full view of British police officers.. who did nothing! I was then hoping that the second picture was showing the man being arrested, no such luck, the police were simply pushing the crowd of violent Muslims back. And to think the same Metropolitan police disgracefully arrested a Jewish Defence League UK member for attempting to debate with hate filled Muslims attacking Israel, just two minutes away from where this picture was taken, The JDL UK also provided a great article on the Met Police officer in the picture and his relation to the arrest of their members, You can read it, here. 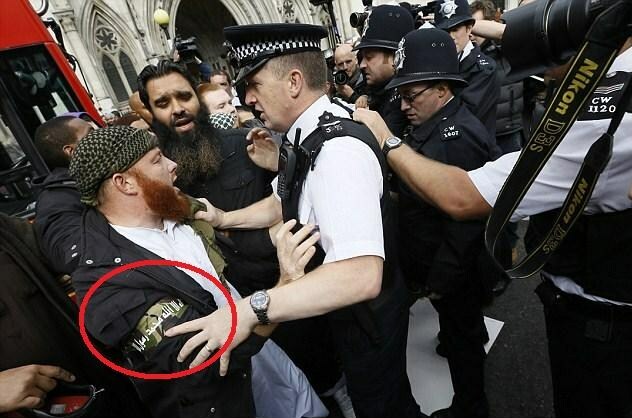 At first, I though the fabric wrapped around the mans arm was actually a Mujahideen headband, I thought it did not fit around his rather large head, so he opted to put it around his arm instead. Then, I then researched Islamic regalia to find out where this man had purchased the Mujahideen insignia from, I tracked it down to an Ebay seller named: wearaloud, based in London. 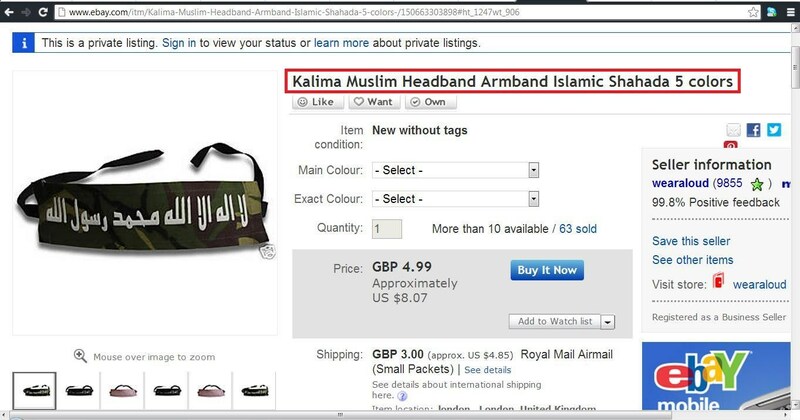 It turns out the armband signifies Islamic Shahada, Shahada as we all know is the declaration of loyalty to Islam and Allah, but, this armband and headband is also worn by the Al-Qassam suicide brigades in Gaza, who have taken countless lives of Jews in Israel in the name of their pathetic Jihad. I also have a mole account in an Islamic forum to enable me to monitor and expose Islamic extremism online, I came across this thread of a mentally disturbed Muslim asking how he can acquire the regalia of Islamic suicide squads, like the Al-Qassam brigade. Here is an example of what the Mujahideen do to captured Infidels, so why is this barbaric allegiance being openly flaunted in the UK? Below is an image of the Bosnian Mujahideen (notice the headband) who took part in the mass beheading, torture and mutilation of Serbian soldiers and civilians in the 1990’s Balkan conflict. Many of the Bosnian Mujahideen were made up of foreign Muslim fighters and in many cases, British born Muslims, including one British Muslim who made a video testimony while on the Bosnian frontline, that he studied to be a doctor at one of the UK’s leading universities and was using his skills taught in the UK to treat Islamic fighters of the Mujahideen wounded in battle. 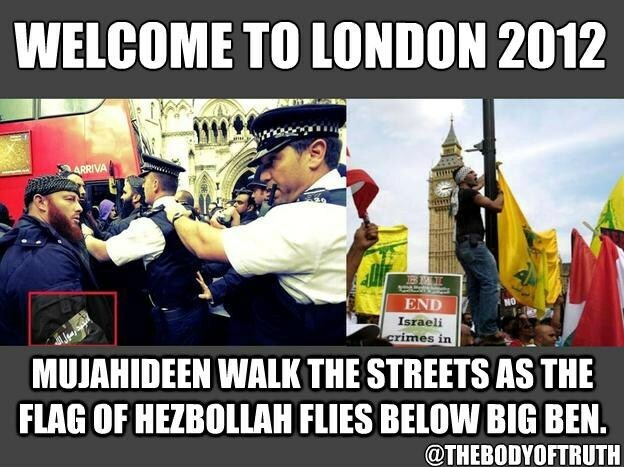 With the British police ignoring Muslims showing allegiance to a violent, world wide, Islamic militia, it is no wonder London is in the mess it is. I despair for the UK and it’s people. Thank You for reading, it is important that you share this article to ensure word of this news spreads further and feel free use the “Follow Blog via email” button in the right sidebar to receive updates on new articles. If you wish to reproduce this article on your own site, please be kind enough to use the WordPress re-blog feature or simply to link back to our original article here, Thank You. This entry was posted in Body of Truth Material, Collapse Of Law and Order, Islam in Europe. Bookmark the permalink. Reblogged this on Christian Defence League (CDL). this country is fast becoming a joke , and if we don’t stand up to these people , instead of doffing our caps to the idiots then woe betide us and the future generations !!!! Well Said, the incidents we are seeing in Europe today are simply the seeds of what is to come further down the line, if Islamization is left unchecked, the situation we will leave for future generations will be much worse than what we are seeing today. Have to say that people are letting this happen in the name of “not being racist”. It has to stop, before it is too late. Good article. i think people will get together and save the small island but the gov is over run and will give away everything in the name of peace. Yeh, there are plenty of religious nut bags out there, aren’t there! The British police, like the police all over the world are afraid of Muzzies. They are afraid to touch them let alone arrest them for fear of backlash. Is this how they maintain law and order in England? This is how they are getting emboldened.